The Superbowl is not until Sunday, but the residents of Indianapolis do not care. Our local news crew is already on the ground in Miami covering every movement of the team. My neighbor has proudly hung a Colts banner outside his front door. Kroger has blue frosted cupcakes and cookies on sale. And yesterday the city dyed the canal blue. You would think water would already be blue, but it wasn’t ELECTRIC BLUE, now was it? No doubt there are some of you who prefer butter to vegetable spreads like I Can’t Believe It’s Not Butter. That’s cool. I understand. You don’t have to enter. You can peruse the ingredients for ICBINB here and make your own informed nutritional decisions about the product. To enter, just leave a comment on this entry. 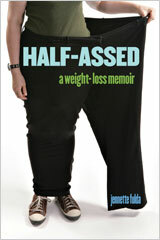 I’m a little late in posting this, so the contest is going to end at 11:59pm on Wednesday, February 3, 2010. The winner will be selected randomly and the prize will be shipped directly to the winner by ICBINB, hopefully in time for your own Superbowl party. ICBINB also wanted you to know they are on Twitter @ICBINotButter. BTW, if you are waiting for my thoughts on week 3 of The Beck Diet Solution, I have fallen a bit behind on that due to personal health problems, but I will try to get caught up by next Monday. Not sure what we are serving at our Super Bowl party yet. I’d love to win this. Would help somewhat with the Superbowl party expenses. What a fun giveaway. Best of luck to all! Love that they have come out with stick CBINB for baking. Thanks for the opportunity to win. I am pulling for the Colts this weekend. I’m also rooting for the Colts! Thanks for the chance to enter. I’d love to win some tasty ICBINB swag for my Superbowl party. Thanks for the chance to enter. I have used ICBINB for years! I want the ICBINB pack please. Go Saints! Oops, I hope that doesn’t affect my chances! LOL at the electric blue canal! I understand the Super Bowl crazy. Last year, when the Cardinals went for the first time ever, Phoenix went nuts. It sure was fun though, even though we lost. Would love to win the gift package! Wouldn’t it be fitting to have the other prize pack go to someone hollering for the Who Dat Nation? We’re not doing much for the Superbowl this year but still need to eat sooo…my name is officially in the hat. Helmet. Whatever. I hope I win and I hope you are feeling better soon. I can’t believe I might actually win. But odds are good that I won’t! I actually like ICBINB best of all non butter products. But I definitely CAN believe it’s not butter. I never win anything, but what the heck!!! Here goes nothing! Hope you’re feeling better soon. Feel better Jennette. I don’t know what I’d do without my daily dose of pasta. I never win anything, but I am trying to think of healthy things to snack on while watching the game so I’m in! OK – I’ll comment and try to win! I’m sure I will enjoy the prize. Superbowl parties sound like fun. I’m sorry you’re not feeling well. OOO I would love to win! I want the new appetizer ideas! I would love to win! I must admit, I only watch the superbowl for commercials. Free food? Yes, please! I haven’t even thought about Super Bowl food yet! I reside in Bear fan country but I’ll be rooting for my neighbors on Sunday! I would love to win, the superbowl is so fun! Rooting for the Colts because it will make my employer lots of money and then I might get a bigger bonus at the end of the year. Hope you feel better soon. Fun times! Nothing better than getting together with friends & family on Superbowl Sunday. I feel like a winner today! I’m in! Can’t believe they dyed the canal blue. Ha! That’s funny. I love the ICBINB spray. I’ve never tried the kind in the tub. Food and football – what’s not to love! Pick me!! ME ME ME!! Delurking just to enter. You are one of my many motivational blogs. I think I am serving indian made- fried chickpeas. Or Falafal as people call it. Fingers crossed that I get picked!!!! I would love to win, even though the superbowl party will be just hubby and me. Go Colts! I hope you’re feeling well soon. A SuperBowl party tray made with healthy treats is a great idea. Thanks for doing the contest. Good luck to the Colts! Love your blog!! Hope you get to feeling better soon! I to am trying to follow the Beck diet…falling a little behind myself. So I am waiting for you…lol. Oh Yeah…Pick me, love the Colts!! One can never have too many serving dishes! mmmm, butter…er…not butter…uh…or am i just supposed to believe its not butter…either way, i like the superbowl! thanks ICBINB & PQ! Love the giveaway! And…I love “I can’t believe it’s not butter!” love love love it! Gonna link back to increase the competition a little! At my house we call it “I wish it was butter butter”… say that 3 times fast. I happen to love I Can’t Believe It’s Not Butter and use it in my recipes quite often. I’ve heard pro’s and cons about it but I’m a calorie girl and it has less calories and tastes good so I’m all for it. Thanks for a great giveaway. Thanks for the chance to win–appreciate it! Sure wish we were watching the Vikings play the Colts (sigh). Hope your Superbowl party is awesome. I’d love to win! Thanks for doing this giveaway! Everything’s better with (not) butter! I heart icbinb- the abbreviation is too cute! oh- and GO COLTS! Count me in on the giveaway! Also, hope you feel better…. Ahhh I’d love to win this. The Superbowl is such an epic event every year (especially for huge football fans) – can’t wait! Who doesn’t love free stuff! Ooh me, pick me! I’ll even blog about it if I win. We love ICBINB – this would be a much appreciated win. Thanks for the chance and feel better soon. We Steelers fans are pretty disappointed that we didn’t make the Superbowl this year. But I still want to win this contest! Thanks PQ! As an Indiana transplant, I’ll be watching from Ohio this weekend. It’s just not the same without being surrounded by all the blue craziness, everything here is red! Fun giveaway! I can’t imagine being surrounded by all the blue craziness!!! Have fun! Would love to win that! Wahooo Super Bowl! Any excuse for a party… even for us non-football types. and I do anjoy all the hints and emails ! I’m a butter fan, but I love free stuff. Thank you ICBINB! I don’t really follow football during the season, but I love a good Super Bowl party! Throwing my hat in the ring for not-butter! mmmmm. I love superbowl food! And I love I can’t believe it’s not butter!! Yum!! I hope I win! I’d love to win! I like the commercials during the Superbowl! I think I’m supposed to be rooting for the Saints.. but I’m really in it for the food and the fun!! we are icbinb spray fanatics! love that icbinb frequently releases high value coupons. Always willing to try a new butter sub. I was going to just go into a whole commercial (why do I remember all these old commercials?) but that that would be too cheesy! I would love to win! PS – Go Saints! Hope your health has improved! I love the spray!! Thanks!! As a long suffering Redskins fan (oh, but the 80’s were good), I have learned to have back up teams to cheer for. Go Colts! That’s sure a lot of preparation for the city (well justified preparation). My Super Bowl prediction: Final score Colts 34-Saints 24. 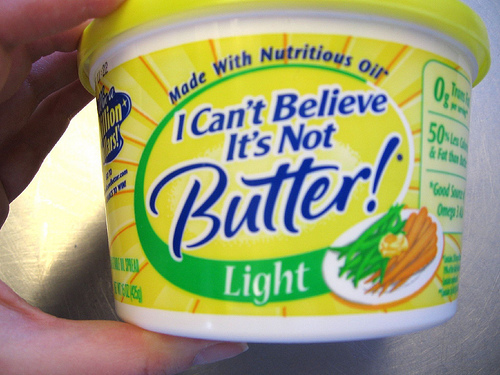 I love “I Can’t Believe It’s Not Butter”! I have some in my fridge right now but I am running a little low. Goooo Colts! Hi Pasta Queen! Honestly, I probably won’t watch the game, but enter me anyway! In fact, just learned who was in it by reading above, LOL. I hope you feel better, looking forward to hearing about week 3. I’m not sure why, but I think this is the awesomest contest ever. I use ICBINB and am a avid(my family says rabid) football fan. It’s meant to be! Would love to win- thanks! Hope you are feeling better! thanks for offering this prize! Go Colts! Sign me up. Great deal! I recently switched to I Can’t Believe It’s Not Butter and I love it. 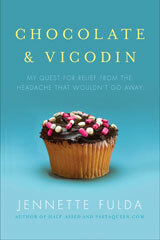 I like to use butter on vegetables and when I started to diet about a year ago most books said to cut it out. That was unrealistic for me. I tried different kinds, even some that seemed healthier than my original butter but were actually worse. I am going to stick with I Can’t Believe It’s Not Butter, in total I have lost 35 pounds. We’re having hot wings, Black-eyed Pea salsa and Pita chips, and pizza! I WILL shake all of the calories out first, of course! Such an interesting prize pack…I would love to win it! I love ICBINB! I use it all the time. I love ICBINB!!!! Pick me, pick me!!! Free stuff is free stuff. I’d love to win your giveaway. Thanks for sharing. I would love to win, I’m all about plan substitutes! Sign me up for a chance to win the big prize-ola. hope all is goign well with your Beck progress! I party with ICBINB al the time!!! Woot!! Whoo hoo i’m numero 120! lol better 120 than not at all though right?? Ooh what a great idea! Thanks! I never win anything, but I’ll give it a shot! I could use the prize because I love super bowl food! Mmmm, hot wings! Oh this sounds like sooo much fun! I would love to win! Thanks!! I think it is only fitting that a New Orleans resident and Saints fan should enter this and win! That’s me! Who dat?!?! Hurricane Brees is coming to town! Stand up and get crunk! Great Giveaway! Thanks for the chance to enter. Go Colts! Count me in I love can’t believe it’s not butter! Hope you’re feeling better. =) Go, Colts! This is perfect! I need a snack idea & dish to put it in for the Superbowl party is was invited to. Who’s playing anyway? She has never lived it down, and likely never will. If I mention that I’m rooting for the Saints, will it harm my chances of winning? Enter me anyhow. Also, I hope your medical problem, whatever it may be, goes away quickly. Ooh I do love some ICBINB SPRAY! Yeah- I was jsut thinkingabout I can’t believe it’s not butter and how my favorite sitcom star Karen from Will and Grace is their spokesperson! I didn’t even know it was Superbowl weekend – I’m in Canada, and I don’t think it’s nearly as big a deal here (I’m sure others will disagree with me). I’m not interested in the prize, but I hope you feel better soon. i can’t believe this contest isnt closed yet, pick meee. I live under a rock and didn’t even realize the Super Bowl was this Sunday, much less who was in it. Does that disqualify me from the contest? ;) If not, count me in too! Count me in! Im working night shift at the hospital superbowl sunday, but we usually celebrate with food,etc in the breakroom! The family fights betweeen ICINB and Brummel and Brown Butter. I would love to win!! Super Bowl Sunday is a huge deal in our family…even if our own favorite teams aren’t playing. A plus would be that we already use ICBINB spray daily!! Interesting giveaway! Thanks for the chance! I would love to win. Go Colts!! A Super Bowl party is a tradition in my house! And so is grilled cheese made with ICBINB. Awesome prize! Hope you feel better soon! UMMM buttah…I actualy use this stuff. I hope the COLTS dominate. And I would like to win. Thanks PQ. Awesome! I would love to win! Thanks for the chance. I can’t believe I have a chance to win. Thanks! Yes please- Count me in! I can’t believe it’s not butter is a good spread (although I don’t use it on a regular basis if it’s not on sale) and I’d love to see what kind of recipes they have up their sleeves! And I can hardly believe the Super Bowl is right around the corner (cuz this means spring training is on the horizon!). Go Colts (I”m a product of the Midwest Smalltown Community-central IL)!! BTW, I don’t usually comment, but I LOVE your blog and your writing! I love the ICBINB spray. I really can’t believe it’s not butter! As a fellow Indy resident, I am tired of all the hoopla, but would love to win to help offset the costs of the obligatory gathering! The give-a-way offer sounds nice. Maybe it’s my lucky day. i would love to win this prize. we use icinb all of the time. hubby loves it because of the low calories. Would love to be picked randomly! I have no problems with ICBINB and I would like to enter. I lived in Indianapolis a million years ago, and only discovered the canal a few years back when I went to visit for my brother’s college graduation. I’m not sure you even HAD a canal when I lived there. Circle Center Mall was nothing but a giant hole in the ground from the time we moved there until I left for college. Too cool! I would love to win. I like that stuff. Thanks for the opportunity! Would love to win. I love ICBINB brand. Its almost ALWAYS (unless I’m out mind you) in my fridge. 7:50 in CA so may be too late, but heck, I’ll give it whirl. And I really, really hope you feel better.